Did I feel cheated? Yeah, a bit. 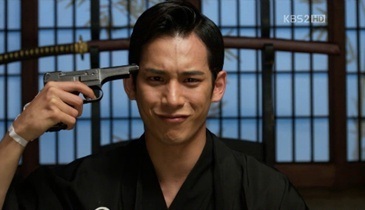 But it didn’t hit me that hard at first, because after seeing Shunji shot MD, my brain literally flew away from my skull. And I couldn’t feel anything. Not even sadness. I was hoping that she would be unconscious and after that recover after being treated. But no. She was killed. For good. I didn’t want to believe it, but the grave scene, with KT mourning, looking like a lost child didn’t affect me at all. I was just staring at the screen. Maybe all the feelings I had before that had been succumbed to the bottom of my heart, plus my brain wasn’t there anymore. Who should be blamed? The writer? Nope, I don’t think so, I want to blame myself. For falling into the deep pit of a Kangto-Mokdan shipper. For that sole reason, I temporarily forgot that this is a drama with historical background. Just like those sageuk or classic dramas, it’s just inevitable for deaths to occur in the drama. No one could escape their fate, no matter who you are. But I forgot that thing. Because I was too busy shipping Kangto and Mokdan, watching them building their hope and planning for their future, although it was like looking at a very distant and almost unclear star in their situation. Romance isn’t everything in this drama. I totally forgot about that. It’s the great cause that mattered the most, more than a mere romance. One thing I suddenly realized at the end: poor Kangto. Poor man, who’s empty in every sense of healthy human relationship – friends, family, and even wife. He’s now alone and lonely. Very, very lonely. Who would cook for him? Who would be willing to lend him her ears, accepting his every sighs and complaints and horrid confessions, yet loving him for who he is? Poor Kangto. Reading through Soompi, a post prompted me to start thinking about the reason why did the writer gave me this ending. Yeah, I’m still trying to comprehend the ending in the way that I’ll be able to accept it. Remember how Kangto kept repeating a line that went something like this? I realized something: the moment he put on the mask, he’s not the ordinary Lee Kangto anymore. He’s the freedom fighter Gaksital. He’s basically the same as the other freedom fighters; the only difference was he had his mask on. He’s been living double lives as Lee Kangto and Gaksital, and finally, he succeeded in shedding his Lee Kangto persona. Mokdan was the only person who’s associated with the Lee Kangto persona and by killing her off, this brought a new meaning to Kangto’s life: no more Kangto, there’s only a man left: Gaksital, the freedom fighter that would protect their country until the end. So, his bride’s death made him a better person, a Gaksital who’s more focused on the independence movement. In the end, I still pity the sad Kangto inside the brave Gaksital. He’s going to be lonely, very very lonely for the rest of his long life, if he survives battle after battle. He would be treated as the national hero Gaksital, but no one would treat him like a family, like a friend, like a husband, like a lover, like a father. The same goes for Shunji. Boy, he was so shaken up after he shot Mokdan. As expected, her death was the only thing that would make him reflect back on what he had done all these time after he joined the Imperial Police. Just like Kangto, Shunji donning the uniform in the first place meant there’s no way for him to return back to his Teacher Shunji persona. I felt unfair for him to kill himself, but that explained a lot and the writer stayed true with her script till the end. He started off as Officer Shunji because of Mokdan, and ended up like that because of her. He’s consistent. He couldn’t change for the better or for the worst; he didn’t have Mokdan on his side for him to be a good guy, plus he himself stated that he didn’t have any desire to serve the Emperor from the beginning, hence he couldn’t stay loyal with the force after his only subject of obsession died. Still…after all those crazy stares and actions and awesome face off…he shot himself. Maybe he’s saving Kangto from another possible murder. If not, Kangto would be the one who’s responsible in sweeping off the Kimura genes on this Earth. Few things I loved about this final episode…. First was Shunji and Rie’s interaction. These two were paired a little too late. If only they were treating each other a little better from the start, then we won’t have this kind of ending. We might get another wedding of the year, with the best man and woman of the beautiful day waiting for their first baby. Well..I am talking about Kangto and Mokdan here. One can always dream. The way they pitied each other were very subtle and sadly, it was only visible after Taro passed away and Shunji looked so lonely. Rie was the only one who held her hand towards Shunji, basically giving him a hand for him to keep holding on. The same happened after Mokdan’s death. She was the only one who went to see him. Heck, these two weren’t given a proper time to develop feelings towards each other. Yikes, why I always thought this drama as a simple romcom? This is not a fluffy drama!! Can someone slap me so that I can snap back to the reality? And this one wasn’t a scene from a romcom. I really loved the scene. Rie’s leaving the city, but she didn’t want Katsuyama to follow her like a shadow after knowing his feelings. She knew that she won’t be able to reciprocate his feelings. She walked off, but soon stopped to tell him her real name. Finally, Ueno Rie also got rid of her Japanese persona and decided to live on with her true persona that’s Chae Hongjoo. The fact that she said that name so proudly made me tearful. And Katsuyama’s promise to remember that name made me even sad for a moment. In the end, none of the couple got together. I am sad. I’ll live with 27 episodes for the time being. Forgive me for being so shallow, but let me nurse my heartbreak for a while. And let me just live in the header about blissfully. I didn’t watch this but I’ve followed a little. 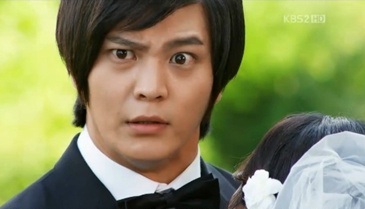 I like the way you analyzed the death of Lee Kangto and birth of only Gaksital. That seems fitting, even if it wasn’t a happy ending. It’s the great cause that mattered the most, more than a mere romance.~ And that was the crux of this drama! One of the reasons that I loved it even though I never expected a happy ending. The ending the way it did, definitely shocking and now I am prepared for it. Otherwise, I think I would have been an emotional wreck. Thank you and all the others that gave us a chance to talk about what I thought was the best dramatic/action drama I’ve ever seen! People continued to try to compare this to City Hunter but I always felt that this was in a class by itself!! Had it been a saguek, there would have been plenty of company but the setting, during the independence movement in Korea makes this different. It was a great story and needed to be told the way it was. As with all wars, conflicts and uprisings; there are victims and we will always remember them! Peace! I didn’t watch this drama but I heard about the sad ending. IMO it’s not much of a surprise because it’s not unusual to have such an ending in this type of drama..
you just said what it is in my head… it really is a very good ending and off course, a “memorable one”, but still it pissed me off to the level where i cant go back to RL for awhile and spending a full day only rants about why she had to die for SJ sake *sigh* i think this is a pay off i must return for being attached too much into a fictional charcter. WTF. Sorry for my rants. I loved reading all your Gaksital posts. I felt like her death was appropriate and necessary for the Kangto and Shunji pairing to reach any kind of resolution that didn’t destroy Kangto’s soul (by having to kill Shunji), but it is heartbreaking to know that every single person that Kangto ever loved, including Shunji, is dead. The ending, tbh, is good and decent actually, but it’s just me that can’t seem to accept it because I really want Kangto to be happy. As for Shunji….I know, he’s bound to be dead at the end of this series, but I still feel his death is unfair. Haha. Maybe the problem is with me,who has become too attached to the characters. Who won’t feel so, after spending several months with this awesome drama? The plot does drag a little during the later episodes…but I’m glad they pull off the extension really well. I really hate any mention of ‘extension’ and this is the first time to see a drama making a successful transition even with the extension announced near episode 9/10.